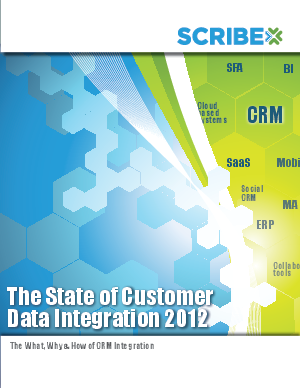 From Scribe Software, the leader in CRM data integration solutions. In February 2012, Scribe Software surveyed 300 business leaders and channel partners to uncover opportunities and challenges associated with customer data integration. "The State of Customer Data Integration in 2012" report contains insights from C-level executives, business analysts and IT engineers, and systems integrators and consultants who design and implement data integration for their enterprise clients. Customer data integration can play a critical role in addressing operational challenges in sales, marketing and customer service. It increases CRM systems' adoption and satisfaction. Many CRM systems remain an island in the business. Third-party vendors and consultants are critical to CRM success - businesses using them see less risk and greater cost savings than those that tackle integration projects without an outside partner.